CDU Alice Springs’ reputation as an artistic hub has been boosted further with a major exhibition of traditional trade-based art attracting more than 100 people to the campus on Thursday evening, 28 November. Creative and engaging works created by CDU VET school students, apprentices and night class students included animated animals created with car parts, exotic mirrors, a carved wooden truck, wrought iron artistic fencing, coffee tables and a wooden chest. This was the first show to feature work outside of Alice Springs. The car-part-sourced animated metalwork of the Engawala community stole the show. 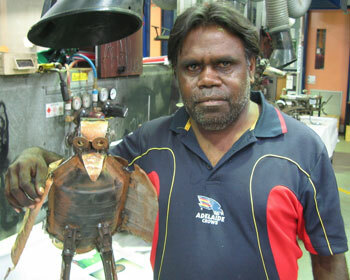 Mark Gooley, VET lecturer in metals, said the exhibition recognised the talents of Central Australians. Home Hardware, BOC Gases and CDU campus administrator Dianne Underwood donated prizes. Pat Organ, VET lecturer in welding, said the exhibition’s Engawala community guests were flattered by the crowd’s response. ‘The Engawala blokes who came out here were really excited to see the level of interest in their work and it’s a huge compliment to have people value their art and buy it,’ he said. Dianne Underwood said the diversity and creativity of talent on show was excellent. ‘People don’t normally associate metalwork and construction with art and creativity but this show proves the demand and interest in this type of work,’ she said.